The habitable zone of a nearby star is filled to the brim with planets that could support alien life, scientists announced Tuesday. An international team of scientists found three potentially habitable planets around the star Gliese 667C, a star 22 light-years from Earth that is orbited by at least six planets, and possibly as many as seven, researchers said. The three planet contenders for alien life are in the star's "habitable zone" — the temperature region around the star where liquid water could exist. 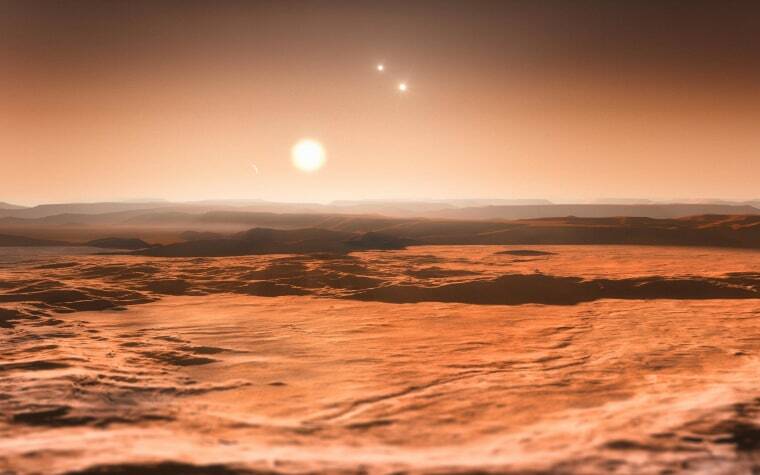 Gliese 667C is part of a three-star system, so the planets could see three suns in their daytime skies. "We knew that the star had three planets from previous studies, so we wanted to see whether there were any more," co-leader of the study Mikko Tuomi of the University of Hertfordshire, U.K. said in a statement. "By adding some new observations and revisiting existing data we were able to confirm these three and confidently reveal several more. Finding three low-mass planets in the star's habitable zone is very exciting!" This is the first time three low-mass planets have been spotted in the habitable zone of the same star system, and it's unlikely that astronomers will find any more around Gliese 667C. The star's habitable zone is packed full, making it impossible for another planet to orbit stably within the zone, the researchers said. "The number of potentially habitable planets in our galaxy is much greater if we can expect to find several of them around each low-mass star — instead of looking at 10 stars to look for a single potentially habitable planet, we now know we can look at just one star and find several of them," team member Rory Barnes of the University of Washington said in a statement. Gliese 667C is the faintest star in the three-star system. From the surface of the planets in orbit around Gliese 667C, the two brighter stars would be as bright as the full moon by night and shine visibly during the day, ESO scientists said. Gliese 667C is cooler and dimmer than the sun, making it possible for planets that have very close-in orbits to remain habitable. This star's habitable zone lies within an orbit the size of Mercury's around the sun, ESO officials said. Follow Miriam Kramer onTwitterandGoogle+. Follow us onTwitter, Facebook andGoogle+. Original article on SPACE.com.